AMD (age related macular degeneration) is a common eye condition and a leading cause of vision loss among people age 55 and older. It causes damage to the macula, a small spot near the centre of the retina (the inside back of the eye) and the part of the eye needed for sharp, central vision, which lets us see objects that are straight ahead. Early detection is key to avoid permanent vision loss with suitable treatment. Who is at Risk of AMD? Those most at risk of developing AMD are people with a family history of AMD, people over the age of 75 and smokers. There are 2 types of AMD. They are known as ‘wet’ and ‘dry’. 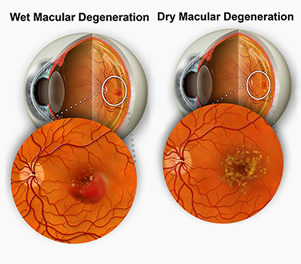 The most common form of age related macular degeneration (AMD) is called the dry form. This form of the disease affects up to 90% of AMD patients. In the early stages of dry AMD, tiny deposits called drusen, start appearing within the retina. These drusen may be so insignificant, that the patient has few, if any, outward symptoms, and no vision loss. As dry AMD progresses, more disruptive drusen begin to appear. As the size and number of drusen increases, patients may begin to notice a small dark spot in their central vision, causing them problems while reading, or driving at night. Drusen alone are not proof of macular degeneration, but they are an important warning sign. It is critical for patients to understand that as dry AMD progresses it can turn into the more severe form called wet AMD. A less common, but more serious form of age related macular degeneration (AMD) is called the wet form. This form of the disease affects about 10% of patients. Abnormal blood vessels begin to develop underneath the retina. These abnormal blood vessels are unusually delicate, and may bleed or leak fluid. This fluid builds up beneath the retina, causing it to bulge or lift up from the back of the eye. The eye is damaged as a result, causing central vision to appear blurred, wavy, or distorted. Wet AMD can progress rapidly, leading to severe vision problems in the affected eye, and causing permanent vision loss. Early diagnosis of wet AMD is critical. If caught early, treatment options exist which may delay or reduce damage to the eye, and decrease the severity of vision loss. 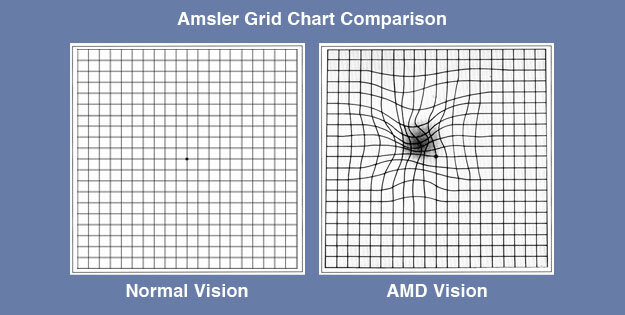 In some people, AMD advances so slowly that vision loss does not occur for a long time. In others, the disease progresses faster and may lead to a loss of vision in one or both eyes. As AMD progresses, a blurred area near the centre of vision is a common symptom. 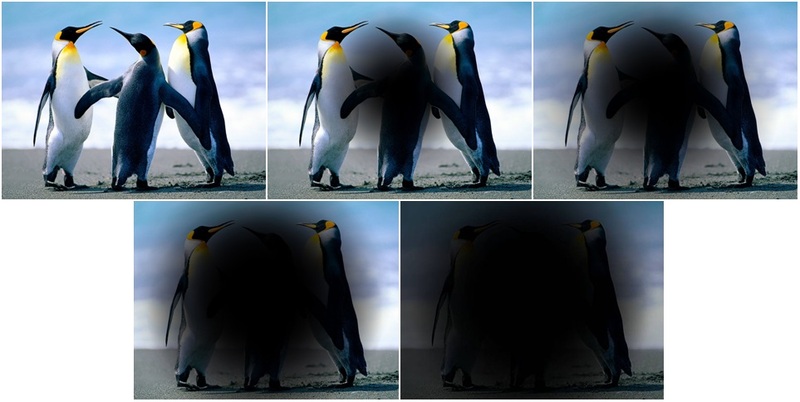 Over time, the blurred area may grow larger or you may develop blank spots in your central vision. Objects also may not appear to be as bright as they used to be. AMD by itself does not lead to complete blindness. However, the loss of central vision in AMD can affect simple everyday activities, such as the ability to see faces, drive, read, write, or do close work, such as cooking or general tasks around the home. Before any procedure can be performed, you will require a thorough eye examination with Dr Furness to ensure you are a suitable candidate. 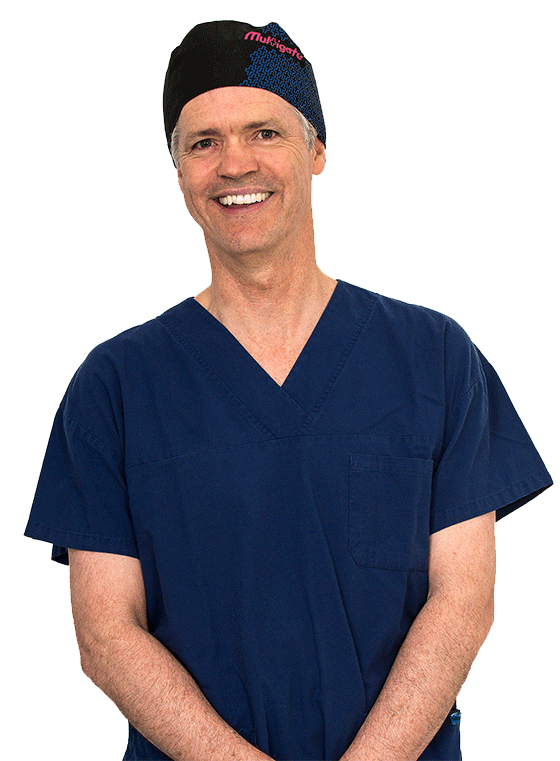 Your consultation will require Dr Furness to dilate your pupils to have a clear unobstructed view of the back of your eye. You will not be able to drive for 3 to 5 hour after your appointment as the dilating pupil drops will leave you blurry and light sensitive. An intravitreal injection is an injection of a medication into the vitreous (the jelly like structure that fills the middle of the eye). Eye care professionals often recommend administering medications directly into the vitreous, as it allows the medication to be placed much closer to where the disease is occurring, while decreasing the risk of side effects. If wet AMD has developed in areas away from the center of the macula, then laser treatment can be an effective option. During laser treatment, a laser is focused through the eye and onto the retina. The laser destroys the abnormal blood vessels located underneath the retina to prevent further damage to the eye. One advantage of laser treatment is that the procedure is not repeated on a regular basis, like other treatment options.